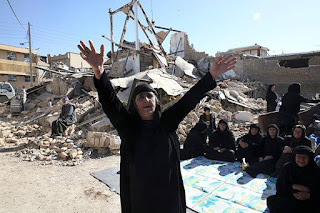 Shiro-Khorshid Forever - شيروخورشيد تا ابد: Devastating Earthquake on the Border of Iran and Iraq Kills over 500 People! Devastating Earthquake on the Border of Iran and Iraq Kills over 500 People! Over the weekend a devastating 7.3 magnitude earth quake hit the Iran/Iraq border destroying towns and villages and killing over 500 victims. Iran’s western province of Kermanshah suffered the most, where hundreds of victims were killed and thousands more injured and left homeless. Kermanshah is a rural mountainous and impoverished region with a large Kurdish population, and a high unemployment rate. Perhaps this is not surprising given Islamic Regime’s animosity towards the Kurds in Iran. The Kurdish population in Iran has always been a vocal and active voice against the Regime in Iran, and has faced the consequences of systematic persecution over the last 37 years. The tragic news of the earthquake in the region of Kermanshah has been devastating for millions of Iranians both inside and outside of Iran. Knowing that hundreds of people have lost their lives and so many more are injured and homeless in the middle of winter is completely heartbreaking. What is even more tragic is the fact that given the Regime’s corruption and lack of concern for its citizens it’s almost impossible to find reliable organizations to make donations for the victims of this tragedy. I think it also goes without saying that the Regime will NOT go out of its way to help the Kurds. Further alarming news from Sarpol-e Zahab, a city that was devastated by the earthquake states that homes that were built by the government were destroyed during the quake while homes that were privately built were much less damaged. I am not surprised by this news. The corrupt Regime in Iran has no care or concern for its citizens and it’s not surprising that the government and its corrupt officials would cut corners and risk the lives of less fortunate people in order to pad their own greedy pockets. My thoughts are with the victims of this earthquake and hope they will be able to receive the help they need.